Taste test: These potato chips had narrow ripples and a fairly thick cut, with a high level of crispness and a very nice crunch. For this type of ripple chip, you usually get much less crunch. The level of saltiness was fairly low, but the potato flavor was fresh and tasty. The art on the bag showed Mr. 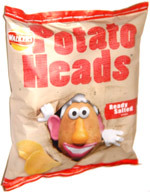 Potato Head ripping a hole to escape from a bag of potatoes. Smell test: Very nice, strong salty potato smell.